Joke L. C. van Beetem (b. 1966) makes sculptures in natural stone. Her work features abstract, geometrical and organic forms. Joke was schooled by sculptors and stone-cutters at home and abroad and her skills were refined through autonomous development. Joke’s interests in architecture, industrial design, geometry and several abstract forms of art, are all reflected in her work. 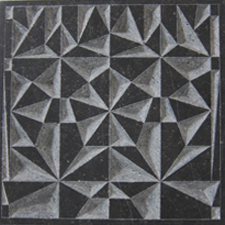 For instance, Joke’s compositions for her stone reliefs are created in a strict mould of geometrical forms, planes, contrasts and rhythms. This work consists of taking a previously prepared design (on paper or as a scale model) and translating it into a stone sculpture. The techniques employed during this process clearly show Joke’s schooling in stone-cutting. In contrast to this, “organic” sculptures flow naturally from Joke’s hands and their ultimate form is defined by the way the original piece of rough stone can be shaped. Initially, the sculptor’s hands are guided more by feeling than by thought. Gradually, the steps to be taken form a refinement of the initial shape and follow a logical path to an ordered and coherent conclusion. Themes like torsion, concave versus convex, symmetry and mirror images are often the starting point for these sculptures and they are therefore often the result of an unconscious expression or of momentary emotions. Joke’s geometrical sculptures are fashioned in a totally different manner. Here, the creative aspect was completed in the design of the earlier scale model or drawing. It then only remains for the sculpture to be hewn from a block of stone made to measure. For Joke, the value of working with natural stone can be found in the desire to express an emotion, movement or designed construction in a spatial creation and in the inner strength and discipline this requires. Stone is a magnificent natural product: It is honest, in a direct way. It requires technique and a consideration of both its tough and vulnerable properties, for only then does the stone permit the sculptor to impose the sculpture’s intended shape on the stone. For the sculptor, it is an enduring challenge to be allowed to work with this unique material. 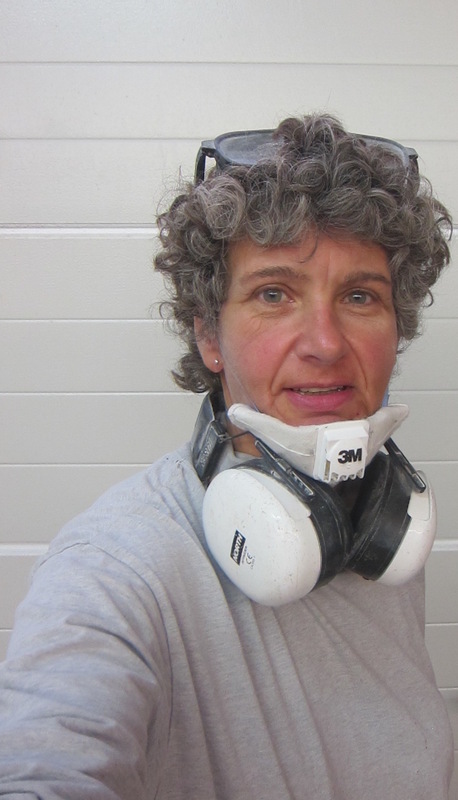 In 2010, Joke’s work was exhibited in the sculpture garden of Museum Dorestad in Wijk bij Duurstede, and she entered work in the art auction for Hospice Nieuwegein. 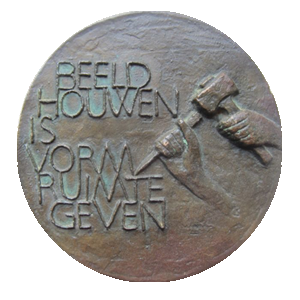 In 2014, Joke’s work was shown in the sculpture garden Uitweg in Lopikerwaard and in 2015 in sculpture garden Zwakanaga in Exloo. Since 2015 Joke participates annually in several art events.